so a couple weeks ago my mom came up to visit and planted some herb pots for my patio. two types of parsely and basil. within a couple days they had shrivled up and died. a week later she brought me a new planter full of pregrown herbs. a day or two later, these herbs looked like they were about to die too. my mom suggested i try bringing them inside. as i was bringing them inside the pot slipped from my hands and shattered all over my carpet (my pottery barn carpet!!!). i have now come to the conclusion that i am not meant to grow herbs as i have never seen someone fail this many times at keeping them alive! i blame my apartment balcony and its lack of sun light or all the little black bugs that swarm the city on hot days. wait, where am i going with this story? i don't know. long story short, after all my failed attempts i bought a rosemary plant AND IT IS STILL ALIVE. 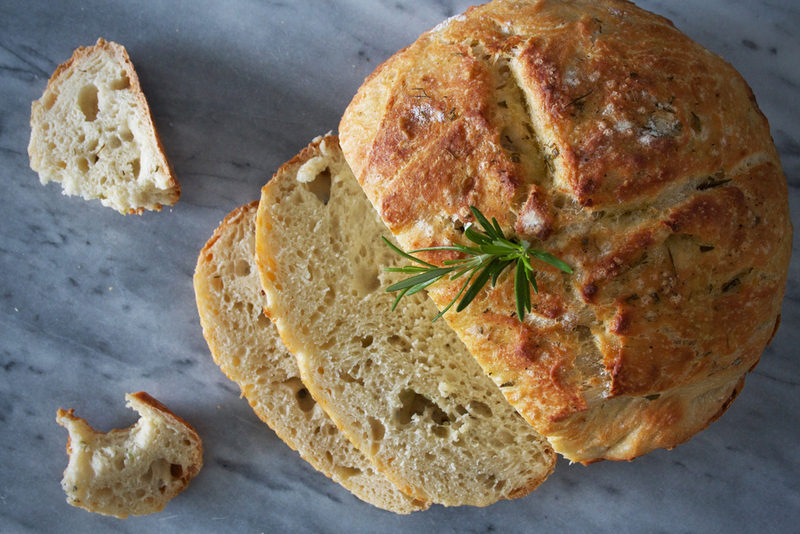 i am celebrating over this no knead rosemary & sea salt bread! it is about as rustic as a loaf of bread can get. you will need a dutch oven to make this as it is what gives the bread its crusty exterior and chewy interior (but you don't need a stand mixer or bread maker, yay?!). make sure to check the temperature limit on your dutch oven before baking the loaf at 450 degrees as they all have different limits. oh yes & happy friday to everyone! start your weekend off right by making this. in a large glass bowl add flour, yeast and salt. pour in water. with a wooden spoon stir until all ingredients are blended and a wet dough forms. seal tight with cling wrap and let rest for 12-14 hours (over night). preheat oven to 450 degrees and place the dutch oven inside. punch down the dough and shape it into a round loaf. brush the top with olive oil and sprinkle with rosemary, sea salt and garlic (optional). cover and let rise again while oven pre-heats. once the dutch oven is piping hot, carefully slide in the dough. place in oven with the lid on and bake for 25 minutes. remove lid and bake for an additional 20 minutes.